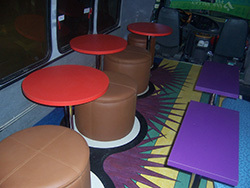 We have our large facility in Brighton and have been serving the Denver CO area since 1999 with custom bus conversions. Our bus conversion clients have traveled from all over the Denver area including Castle Rock, Fort Collins and even from out of state for their personalized custom bus conversion. When school buses are retired and auctioned off by school districts or school bus companies, many of them gain a second life in some unique way, shape or form. We are here to make your custom bus conversion into a reality. We do business the old fashion way by building strong lasting relationships while providing our clients with quality, and premium craftsmanship on each and every custom bus conversion project. There are many creative ways to make your bus more like what you have envisioned such as adding function and beauty to your bus conversion by upgrading the exterior with power awnings, custom fenders, stainless steel trim, head lights and grill updates and more. The interior we can install new seating, flooring, surround sound and just about anything you can think of. Let our family at TMS Truck and bus in Brighton CO make your bus conversion a reality.